The A2 is a light combining an incandescent lamp with LEDs, it has many factors that make it a very unique light. Originally the A2 was designed for pilots, the LEDs would allow cabin cockpit illumination without disturbing night vision while the incandescent bulb would be used to inspect the aircraft from outside. Not only this was a complete success for pilots but it became a very interesting light for general use and even EDC. The switch of the A2 is a lockout tailcap with 2 levels, in the "locked" position the light can't be activated accidentally and is used for storage. If you screw the tailcap a little you will be able to use the LEDs pressing the tailcap button, if you keep screwing the LEDs will come on permanently and you will be able to use the Incandescent beam pressing the button, if you keep screwing the incandescent beam comes on permanently. The interface works great, a very common pattern is to use the constant-on for the LEDs and activate the incandescent beam when needed. The main beam is regulated this uncommon feature for incandescent beams means that the brightness will be constant regardless of the state of the batteries, when the batteries can't power the main beam you will still have plenty of time from the LEDs since the battery will still have a 25% charge aproximately. Without the LEDs regulation wouldn't make sense since it will be a waste of battery life. The main beam is tightly focused with a very long throw, the A2 can reach objects that are really far away and illuminate them properly with very good color rendition. The LEDs offer a floody beam perfect for a tasklight and indoors operation. The runtime is 50 minutes for the incandescent beam and more than 200 hours for the LEDs. The body is HA-III aluminium resistant to impacts and scratches of all kinds and orings are used to make the light water-proof. Commonly accepted as an engineering marvel the A2 is a perfect combination of LEDs and incandescent light and the fact that there is no other light with similar characteristics probably demonstrates how good the A2 is. The A2 can be ordered with red, gree, blue or yellow-green LEDs (See this article about LED colors). You can read more from Surefire's website or order for $195 from OpticsHQ. This is a self-contained spherical screwdriver tool for a keychain. The body of the tool is made of nylon plastic and the drivers are made from 4140 steel. It has 8 different drivers: a flat #1 screwdriver, a philips #0, a philips #1, a 3/32'' Allen Wrench, a 1/8'' Allen Wrench, a #10 star wrench, a #15 star wrench, and an eyeglass screwdriver. The keychain has a split ring and can be dettached from the body of the tool. Besides being a novelty item this tool will be useful if the drivers it has are useful for your tasks, being a spheric object the grip is usually good as long as you don't need a lot of force, the other drivers stored help the grip and it will not be slippery. You can order for about $15 from this site. The Ti-Pull is a Titanium Zipper Pull by Knife Maker and artist Tom Anderson. The piece is made from 6AL4V titanium with a heavy duty Stainless Steel Split Ring, it is 1/2'' in diameter. The design is very nice and useful, the knurled body helps the grip and the titanium makes the pull almost weightless compared to other metal pulls. It can also be used as a fob for a keychain or a lanyard it can even be used as a piece of jewelry on your neck if you want. The ti-pull can be ordered for $30 from Tom Anderson's website. They Keyton is a small keychain tool inspired in the classic rock climber's "piton". The keyton is basically a prytool, you can use it to pry things, scrap, sepparate, mix etc. While it seems that a prytool is only useful in very special ocassions the prybaby has demonstrated that it will be a very useful tool in many ocassions. 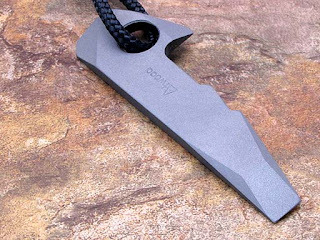 You will be surprised by the number of times that pulling a solid piece of steel from your pocket or keychain is a good idea. The keyton has two screwdrivers bevels in the handle end that might become handy if you need a screwdriver in a hurry. The tool is made of 1/8'' thick S30V steel, extremely solid and resistant. It weights just 0.8oz and is almost 3 inches long. You can order for $45 from Peter Atwood's website. The Inova X5 is a flashlight with five 5mm leds in the bezel using 2 123 lithium cells for power (red version uses only 1 cell). There are many multi-LED flashlights in the market most of them are cheap aluminium lights using 2 or 3 AAA or AA cells, they are usually dim and unreliable, the X5 is what happens when the design is the same but the quality and the engineering is right. 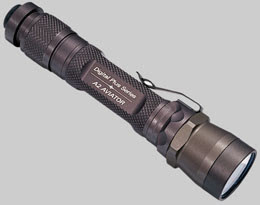 The five LEDs in the X5 are contained in mini-recessed metal reflectors in the head of the light, the switch is a twist on/off with a rubber button for momentary on, commonly known as a lockout tactical switch. You can twist the tail until the light is on for constant operation or untwist a little and the light will turn off but will be activated by the rubber button if you keep untwisting the light is locked and can't be turned on this helps storing the light without the risk of running out of batteries. The beam of the X5 is all flood, the light will quickly illuminate a room because of the very broad beam, because of this the X5 is great as a task light and for indoor operation or working but will not be good to illuminate distant objects outside since it has a very limited throw. The X5 has a long runtime, about 20 hours so it can be used for many tasks where a long runtime is needed like camping. The LEDs can be either white, red, green or UV (see article on LED colors). The body is anodized aluminium either in black or gray finish, o-rings are used to make the light water resistant. If you are looking for a small flashlight with a reasonable price and a flood beam the X5 is an excellent option and you can get it in different colors, remember this is not a bright light but it will be a classic because of the broad beam, long runtime and strong construction. The new Evo Grip line from Wenger is a line of Swiss Army Knives (SAKs) multi-tools with rubberish scales for improved grip and usability. The S557 model is the one with more features there are other models with fewer tools than this one and the same grip system. The tools include a very good philips screwdriver, a corkscrew, scissors with micro-serrated edges, a can opener, nail file, a locking blade, a cap lifter, awl, tweezers, wrench toothpick, pliers and the typical keyring. The blade has a locking feature activated with a lever release, that looks to be good. 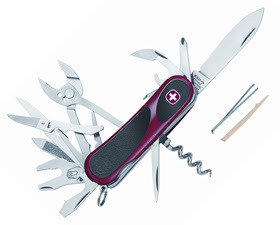 The corkscrew is probably not very useful but it can be used to attach a victorinox mini screwdriver (The Wenger does not include one). The wrench is a very nice tool that will fit nuts up to 5/16", this is not common in SAKs and can be useful. The awl does not have a thread hole so it can't be used to thread cord. The S557 is a very complete multi-tool with a very nice locking blade, excellent scissors and pliers and the nice touch of the wrench complemented by many other tools. The Evo Grip system feels very well and will provide a very good grip to use the tools. With a quality that can certainly match Victorinox and the special details this tool has it is a very interesting option for your EDC SAK. You can read more and order for about $60 from this site.